It’s that time of year again. The time when we take advantage of the warm weather and the beautiful outdoors. Yet, just as we are about to sit down on the back porch, hike some great Ontario trails, or water our gardens, we hear the familiar buzz or feel the not so pleasant sting. It’s mosquito season! 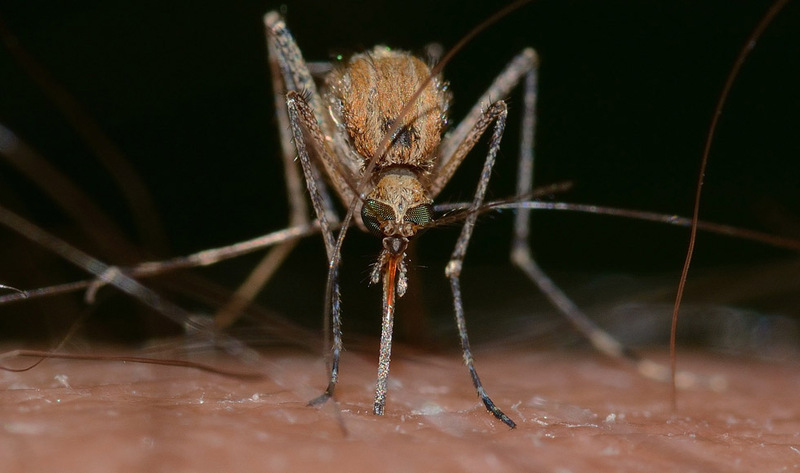 Rosa da Silva, assistant professor in theDepartment of Biology and School of Interdisciplinary Science at McMaster, explains the habits and trends around mosquito populations and how to combat them in order to continue to enjoy the summer months. We can all agree that mosquitoes can be annoying critters, but they are also incredible organisms. They spend part of their life in the water as larvae and as pupae, feeding off of bacteria and algae. As time passes, and under the right conditions, they then emerge from their aquatic habitats as adults with wings that help them fly to find their next meal. Yet we can’t blame all mosquitoes for their nasty bites. The reality is that only female mosquitoes will gorge on blood meals, while male mosquitoes will only feed on flower nectar. Female mosquitoes need blood for reproduction, and use the nutrients from our blood to make their eggs. The itchy bite mark that is left behind is a natural response produced by our own bodies in reaction to the “saliva” that leaves the mosquito’s proboscis (mouth) when it bites. The annoying backyard invaders we encounter each summer are most likely the common or northern house mosquito, formally called Culex pipiens. Yet, you may notice that their numbers change from year to year. This is because the successful reproduction of mosquitoes depends on precipitation levels and warm weather. We don’t see any mosquitoes flying around throughout the winter because they are ectothermic animals, meaning that adult mosquitoes tend to hibernate (diapause) throughout the colder months within protected areas, such as human made structures. This past winter season brought with it a great deal of precipitation. This provided ideal conditions for female mosquitoes in which to lay their eggs, once the snow and ice turned into standing water during warmer spring days. Once the weather started heating up in June, it became quite obvious that there were a great deal of newly emerged adult mosquitoes flying about during the late spring and early summer, all due to the favourable conditions provided by a heavy winter and warmer-than-usual spring. During the remainder of the summer and into the fall, the size of mosquito populations will really depend on the amount of rain we get. While hot and dry summers do not help with the appearance of our front lawns, these conditions will actually help stave off large numbers of mosquitoes. This is because their natural life cycle will be interrupted. With less precipitation, there is less pooling water and fewer female mosquitoes will be able to lay eggs. However, there is some caution to be had: While really hot and dry weather is less favourable for our local mosquito species, the warming climate has caused range expansion for Southern mosquito residents that would normally localize to tropical or subtropical regions. These pests from the South, including the mosquito that spreads yellow fever (Aedes aegipti) and the Asian tiger mosquito (Aedes albopictus) which tend to be carriers of more dangerous mosquito-transmitted viruses, such as the Zika virus. These mosquitoes have already been spotted in Windsor, Ontario over the last two years; fortunately, they have so far tested negative for any dangerous viruses. While not currently a health threat, these foreign mosquitoes could become problematic with continued warming climates in the future. How do I deal with them now? Weather experts predict a warm and occasionally stormy forecast for the remainder of the summer in Southern Ontario. The relative abundance of mosquitoes will depend on how much precipitation we receive, and how many warm days align with rainy days. With the most recent hot and dry weather that we have experienced in early July, you may find it easier right now to walk out to your backyard without being faced by many mosquitoes. That could change throughout the rest of the summer, however. Drain any standing water on your property, including flower pots, garden ornaments, and clogged gutters. Avoid outdoor activities at dawn and dusk. If you are outdoors during peak mosquito activity, wear light-coloured, long-sleeve shirts and long pants, and use an insect repellent containing DEET. Mosquitoes can hit us with nasty bites, but it is with increased awareness of their behaviour, life cycle and our own personal protective measures that the summer can be the most wonderful time of the year for all of us – and not just the mosquitoes! We believe in the free flow of information. This work is licensed under a Creative Commons Attribution-No Derivs 2.5 Canada (CC BY-ND 2.5 CA), so you can republish our articles for free, online or in print. The Communications and Public Affairs Office is staffed from 8:30 a.m. to 4:30 p.m. Monday to Friday. The University has a broadcast quality television studio to facilitate live and pre-recorded interviews with media. Learn more about our experts. Get the latest McMASTER research news delivered right to your inbox. Evolutionary biologist Jonathan Pruitt has found that the success of colony spiders' cooperative societies depends on their neighbours, not on their level of aggression. Male plainfin midshipman fish take care of the nest, but climate change is affecting their ability to raise their offspring.